In typical Karen McGrane fashion she makes a clear case for dealing with content first. Not just for responsive sites, but for any site. Seems like a lot of people are laboring under the mistaken impression that using responsive design means they can make a mobile website without dealing with their content problem. Where’d they get that dumb idea? Before you begin your next responsive redesign, or any redesign for that matter, read Responsive Design Won’t Fix Your Content Problem by Karen McGrane. What Bruce Lee can teach us about web design. This one quote contains all the wisdom we need to approach our web projects in a way that helps us survive in an unpredictable and ever changing industry. Let’s face it, there are times were it can feel like we’re doing battle as we work on some projects. Battling with clients, stakeholders, designers, developers and everyone else that’s involved throughout the process. So what better way to face these challenges then armed with an attitude that is adaptive, flexible and fluid. Content lives within an ecosystem much like any other organism on the planet. Like other organism there are a multitude of factors have influence over its existence. It’s important to know what those factors are in order to develop a strategy to deal with them. 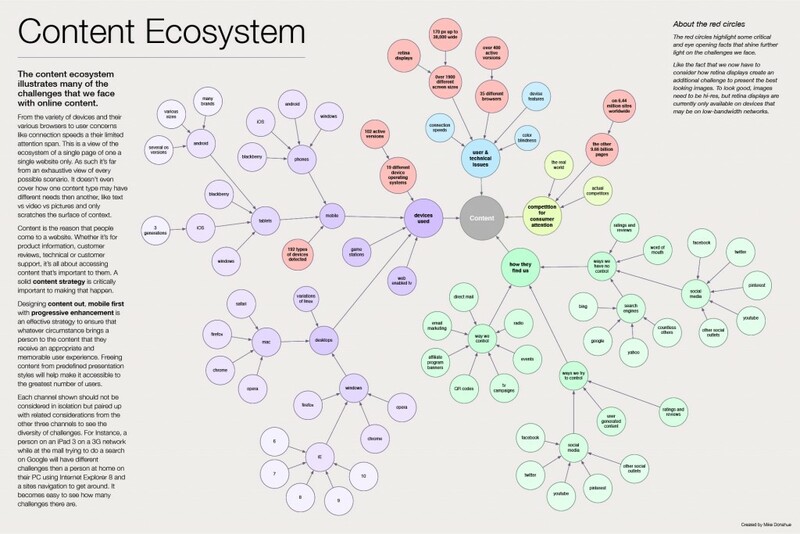 A look at the ecosystem that a single piece of content lives in. Over the last year or so much has changed in web design. Our big problem use to be backwards compatibility with IE6. But now we find ourselves in the midst of a zombie apocalypse. New smart-phones and tablets are popping up faster then the brain hungry undead in a George A. Romero movie. Luckily a lot very of smart people have been paying attention and coming up with ideas and solution on how to deal with this impending apocalypse. Here’s brief summary of all the lessons learned over the last year. Follow them and you just might survive.